Have you tried any ice sensory activities with your kids? We love to paint on ice and explore fizzy vinegar ice. Ice excavation is our absolute favorite activity and is probably one of the simplest sensory activities. We have done a different version for every holiday all year long. 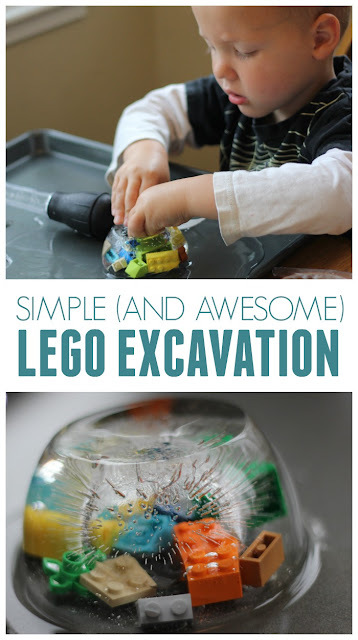 This minifigure ice excavation activity shared by Lemon Lime Adventures is on our weekend "to do" list. Today for LEGO Week we created a really simple, but awesome, ice excavation activity using a few LEGO bricks. 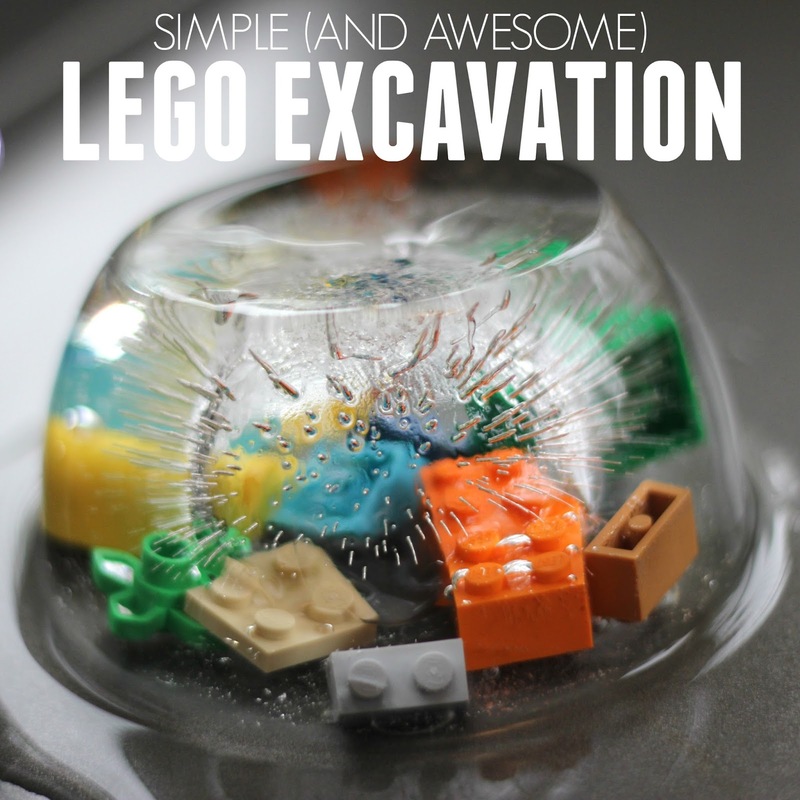 Setting up a LEGO brick ice excavation is so simple!! All you need to do it add LEGO bricks into a tupperware container and fill it halfway with water! The put the tupperware in the fridge for 3-4 hours and let it harden. Next, fill the tupperware 3/4 the way full and then let that completely harden overnight. The next day you are ready for some ice excavation! To get set up for ice excavation I fill up cups with warm water and then I also give each child a baking pan that is about 1 inch deep. Next I pop the ice/bricks out of the containers and put them on the baking pans. Then the kids are ready to start exploring! We used turkey basters or droppers to drop warm water on the ice. The goal is to get all of the LEGO bricks out of the ice and put them in our big bowl in the middle of the table. My little preschoolers were very focused as they tried to get the bricks out of the big hunk of ice. I loved watching them use their hands, turkey basters, forks, and other materials they found around the kitchen to try and get the LEGO bricks out of their hunk of ice. As they sprayed the bricks with more and more warm water the kids would comment on what was happening. They also used their creativity to come up with other ways to get the ice to melt faster. Once all of the bricks were freed we build some creative things out of the LEGO bricks. After that the kids were begging to refreeze the LEGO bricks and try again! They don't really get bored of ice excavations (especially when it is hot outside) and like to do them again and again! 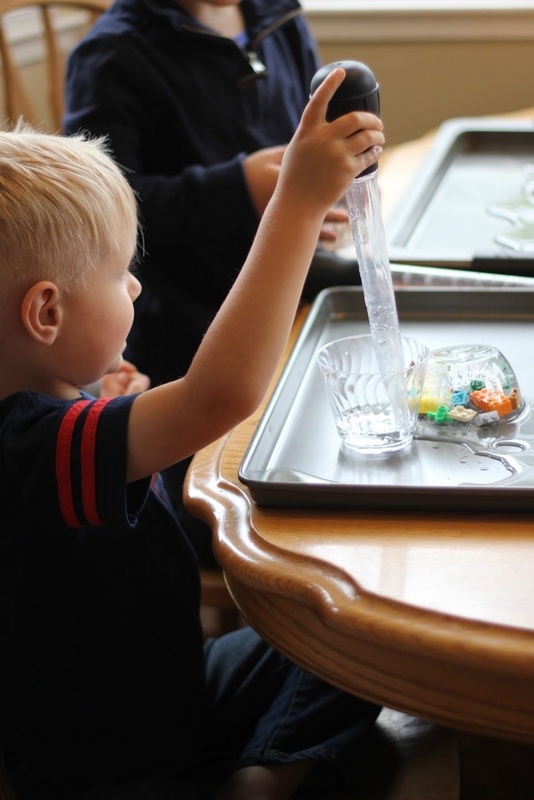 This is such a simple science activity to use to introduce liquids and solids to kids and explain a bit about how ice melts and the ways to make it melt faster or slower. Have you tried ice excavation yet? What did you put in the ice? What tools did you use to help with excavation?